Welcome to a very special episode of BrickBusters. 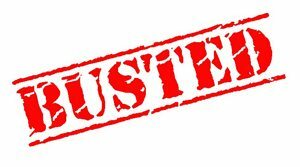 In this article, we are going to explore some common myths around traps, and see if we can bust those brick myths once and for all. 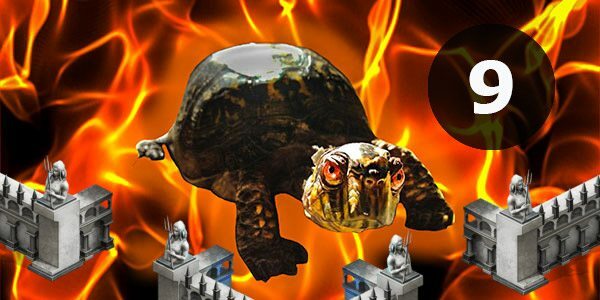 If you are not quite sure where you are, this is part 9 of our guide to Solo Defense turtle accounts, and this one will be focusing on the utility of wall traps to various sized turtles. 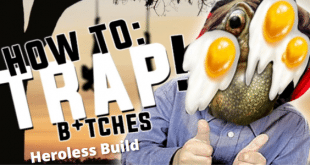 In part 2 of this series we gave some indicative guidance on wall trap research, as well as briefly discussing potential trap numbers for a couple of different potential account builds. This post and the next post will look to try and bust a series of myths around wall traps, and look at the decisions to be made about tiering of wall traps, whether you should use a lower tier trap meat shield, the interaction between traps and troop tiers, as well as briefly looking at the effect of boosting trap attack on a T3 turtle. Part of the ground covered here has already been covered in our Guide to Traps in Game of War, but for those that really want to see some of the evidence behind that article, this should meet that need. We have a lot to cover, so let’s get started. The first question we will be looking to test is whether traps do anything when hidden ‘behind’ a large army of lower tier troops. A common comment we have seen is that if you have T1-2 troops and T3 or even T4 traps, then the traps are completely inactive, i.e. in battle situations, they do not come into play at all, do not get damaged, and deliver no damage. So, to test this we are going to use a series of hits on our large T1 turtle with many million Tier 1 troops, as well as 125k regular T3 traps. Attacking force is 250k balanced strategic T3, as per previous tests. There are no siege troops used in this set of tests. Attacking hero is as per previous descriptions in part 6 and part 8, with a focus on defensive boosts, being health / defence and troop attack debuff, to try and minimise attacking troop losses (not easy against 8M T1). Defensively, the army has an army of over 8M regular T1, with the standard hero as outlined in part 6. What was done was the turtle was hit, and then hit 5 more times in succession after changing trap number by 5000 T3 traps. As such, there is a sequence of 6 hits ranging from 100k T3 to 125k T3 traps. The only thing that changed between these hits is the number of traps, with all affected T1 troops being healed between hits. So, to answer the first question that has been raised: Even though not a single trap is damaged, it is true that T3 traps definitely do participate in the battle even when hidden ‘behind’ a mass army of T1 troops. You could almost say that the T1 troops are acting as a meat shield for the T3 traps. 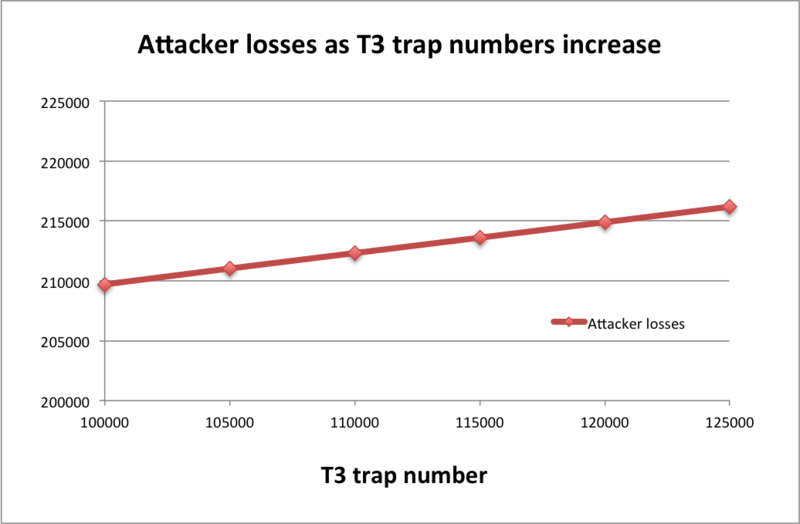 The first thing to note is that not surprisingly, as you increase the number of traps from 100k T3 traps to 125k T3 traps, the number of kills goes up in a linear fashion. And interestingly, even though the T3 traps are notionally ‘behind’ the T1 troops (more on that later), they also serve to reduce the losses of defending troops, again in a very predictable linear fashion. BRICK MYTH #2: That T1 traps or war bricks in front of T1 troops are better than T3 traps ‘behind’ a mass army of T1 troops. The theory behind this one is that traps ‘in front of troops’ means that the attacker takes a ‘turn’, whereby the attacker has to attack your traps first and clear them out, then allowing your traps and troops to attack their troops, before the attacker (with a reduced force) gets to attack your T1 troops. So, from a base of 100k T3 traps, using the same attacking and defending setup, we have added either 25k war bricks to our existing set of 100k T3 traps and tested, then replaced the war bricks with 25k balanced T1 traps to our existing lot of 100k T3 traps. This should give us an idea of the value of a T1 trap ‘meat shield’. And here we see that from a trap defense perspective, the war bricks are weaker. They have 66 bricks destroyed and 104 salvaged, whereas the T1 traps have 20 destroyed and 22 salvaged. But interestingly, when looking at the results from the troop defense perspective, both tests show exactly 84028 troop wounded. From a troop defense perspective, T1 traps and war bricks are identical. Adding 25k T1 traps or 25k war bricks is definitely better from a troop defence perspective than leaving an incomplete wall with only 100k T3 traps. But it is not quite as good as a full T3 wall. But the results on troop defence are remarkably close to that of having a full T3 wall. 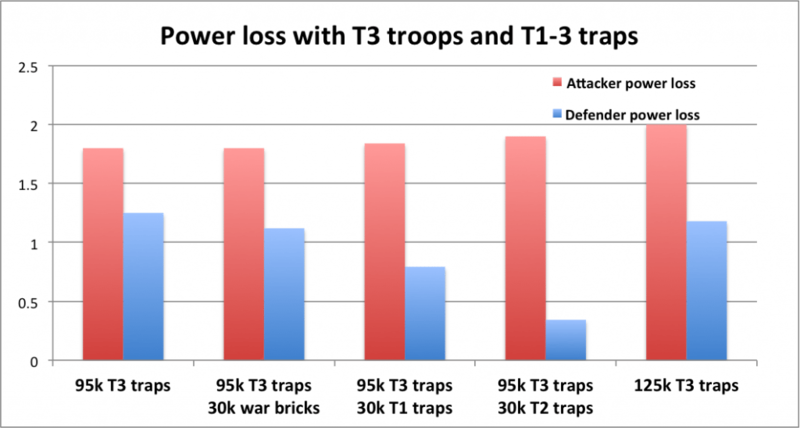 And if the results are compared to the results of having 120k T3 traps, which had 84211 troops hospitalised, it is clear that from the perspective of troop defence, 25k war bricks as part of a complete wall, can give better results are better than 20k T3 traps as part of an incomplete wall. So, chalk up a partial win for the war bricks!!!! When we look at the ability of war bricks or T1 traps to kill attacking troops, the picture is quite different. Here, 25k war bricks are only slightly better than having nothing. A balanced set of regular T1 traps do a much better job of killing incoming attackers, but there is a big jump up to a balanced set of T3 traps. Sorry that the tests were not done with T2 traps as well, but they will be examined separately later. I think you can probably work out about where they would fit on both curves in between T1 and T3. This is a clear win for T3 traps, showing that even ‘behind’ a T1 mass army, they still do a great job of killing incoming troops. Sorry, but T3 traps do a better job than T1 traps or war bricks when paired with a large T1 army. 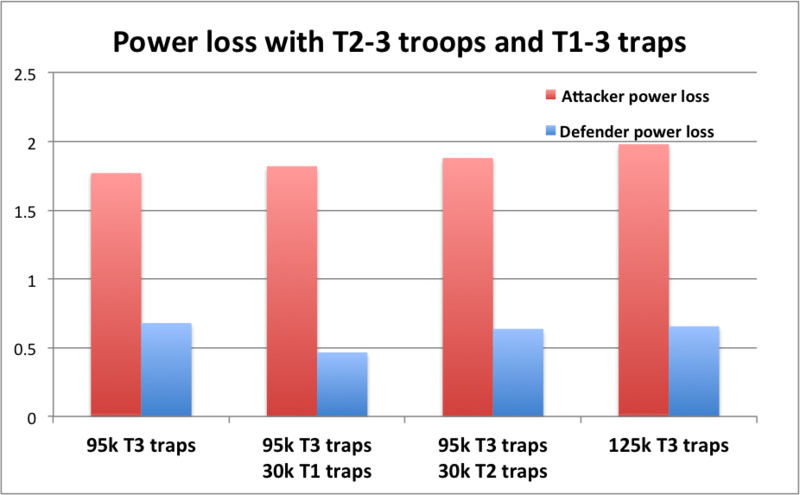 They are slightly better on trap defence (no T3 traps lost), slightly better on troop defence, and clearly a lot better on trap attack, on the important metric of killing the attacker’s troops. Another element that comes out of this is that the war bricks are NOT out ‘in front of’ T1 traps. War bricks do not appear to provide a true ‘meat shield’ effect for T1 troops, i.e. the battle algorithm considers them to be the equivalent tier as T1 troops and T1 traps. If they were truly ‘out in front of’ the T1 troops and acting as a meat shield, then you would expect them to have to all be destroyed before the T1 traps can be attacked. But if you look at the battle reports, you can see that only 170 war bricks were affected by this attack, and 24830 war bricks remained intact. This is inconsistent with the war bricks acting as a meat shield whereby they have to be all destroyed before the T1 troops can be attacked. It is however completely in line with our Guide to Traps, which outlines that the overall damage delivered is split between troop and traps in the ratio in which they are present. In this case, we have 8.8M T1 troops, and 25k War bricks, which are considered to be the same tier, so only a tiny proportion of the damage is applied to the 25k war bricks, and the remained is applied to the T1 troops. We will have a lot more on this tiering effect later when looking at a more typical T2-3 turtle, rather than the much less usual T1 monster. But a clear take-away is that completely in line with the guidance of the Guide to Traps, that when you are ready to go out and fight, you should always go into battle with a full wall. If you can’t have a full wall of your highest tier, then by all means fill up the remainder with war bricks. FULL WALL, PEOPLE. FULL WALL. MYTH NUMBER 3: Traps act as meat shields for higher tier troops. The way we are going to test this is to use our T2-3 turtle, which has previously been configured with 500k T3 and 500k T2 troops, as part of model 4 in Part 5 – Troops and Part 6 – Armies from this series. The main difference is that we are going to configure it in two manners, either with 600k T3 or with 400k T3 and 300k T2. The main reason for that is so that results are comparable between hits. The same attacking force will be used, and if you do the calculations, 600k T3 equates to 1800k strength (600k x 3), and 400k T3 is 1200k strength, with a 300k T2 meat shield adding another 600k strength (300k x 2). Thus, they are basically equal on troop strength, which means they should kill about the same number of incoming attacking troops, so that comparisons are easier. In combination with these two different army compositions, we are going to pair T3 traps, a mix of T2 and T3 traps, a mix of T1 and T3 traps, and a mix of war bricks and T3 traps. Similar to the above set of tests, we will be using 95k T3 traps as our ‘baseline’, and then adding a balanced mix of 10k each of T1, T2 or T3 traps, or 30k war bricks. Here we have 2 attacks, the one on the left being a defensive force of 600k T3 troops with 95k T3 traps. The one on the right is a defensive force of 400k T3, 300k T2 troops, and 95k T3 traps. As you can see, the defensive forces kill a similar number of troops, being 74-75k troops. Not a perfect analog, but this likely reflects 2 factors, a small inter-tier debuff, such that T2 troops have a small attack debuff against T3 troops, as well as T2 troops have a small health debuff against T3 traps. These kind of small inter-tier debuffs have been seen in other instances. The main difference to note with this test is that with the T3 only test on the left, 1468 T3 traps were affected by the attack. In the attack on the right, no T3 traps were affected by the attack. And secondly, the power lost by the defender is significantly lower at 679k, reflecting the lower power loss with T2 troops compared to T3 troops. Under the old KE points scheme, the defender would have given up just over 1 million points with the T3 attack on the left, compared to 84k points on the T2 wounded attack on the right. Under new KE points scheme of enemy power destroyed, the gap is a lot smaller. It is not less than twice, as opposed to 10 times more points given up by the T3 only turtle. Replacing the destroyed T3 traps and adding 10k of each regular T1 trap results in further improvements to the T3 defender on the left. We get a small further increase in attacking troops killed, up from 75k to 77k. On the defensive side, we again lose all 30k of the T1 traps, with an additional 858 T3 traps destroyed, slightly down from the war brick example. But importantly, we get a significant reduction in T3 troops wounded, down from 45k to 30k. As a result, the power lost reduces from 1.12M with the war bricks test to 793k with the T1 traps test. With the T2 troop example on the right, we again see a similar number of attacking troops killed when compared to the T3 example on the left. On the defensive side, all 30000 T1 traps are destroyed or salvaged, and 0 T3 traps are affected. However 50k T2 troops are wounded, resulting in a power loss of 466.5k. This is significantly better than the baseline, reducing power lost from 679k to 443k. 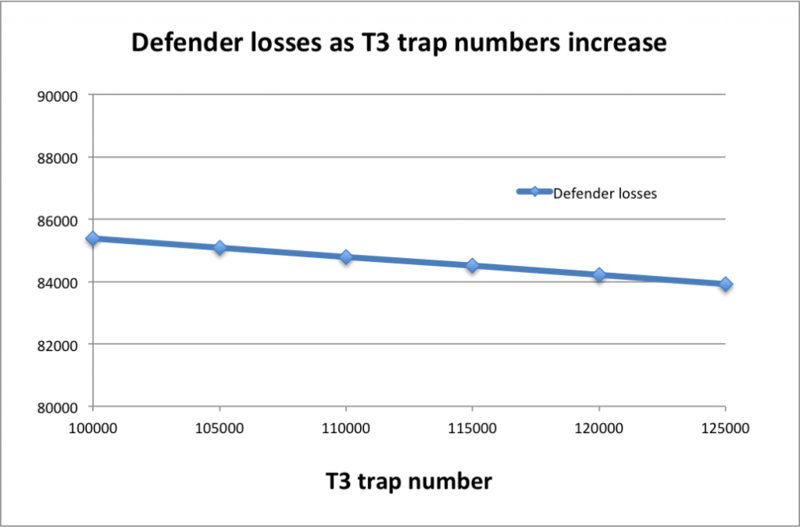 Replacing the destroyed T3 traps and adding 10k of each regular T2 trap results in further improvements to the T3 defender on the left. We get a small further increase in attacking troops killed, up from 77k to 79k. On the defensive side, we again lose all 30k of the T2 traps, with an additional 297 T3 traps destroyed. But importantly, we get a significant reduction in T3 troops wounded, down from 30k to 10k. As a result, the power lost reduces from 793k with the T1 traps test to 343k with the T2 traps test. With the T2 troop example on the right, we again see a similar number of attacking troops killed when compared to the T3 example on the left. On the defensive side, only 1413 T2 traps are destroyed or salvaged, and 0 T3 traps are affected. However 79k T2 troops are wounded, resulting in a power loss of 637k. This is only slightly better than the baseline, and clearly worse than the prior test using T1 traps in front of T2 troops. Filling the wall with T3 traps to a full 125k results in an additional 4k kills of the attacking troops. This is in line with what we saw with the first set of tests, where the best outcome in terms of killing the attacker’s troops came with a full T3 wall. On the defensive side, 1830 traps are now affected, up slightly from the 1468 T3 traps affected when there were 95k T3 traps in the wall. On the troop side, the losses are reduced by around 2k T3 troops from 51k to 49k. Thus we have a slight increase in power destroyed (1.8M vs 2M), with a slight reduction in power lost (1.25M vs 1.18M). It is clear that there are benefits to having a full wall. When looking at the test on the right which has T2 troops in front of the T3 traps, we see that again there is a material increase in the number of attacking troops killed. Now, on the defensive side, there are NO T3 traps destroyed, whilst there are 82k T2 troops wounded. This results in quite a bit less power loss than the T3 troop example, and a very slight increase in the power lost when compared with the prior series of tests with T2 traps. In the graph at right we have a comparison of the results of these 5 tests when only looking at the examples with T3 troops defending. From left to right we have the baseline of 95k traps, then war bricks, T1, T2 and finally a full T3 wall. 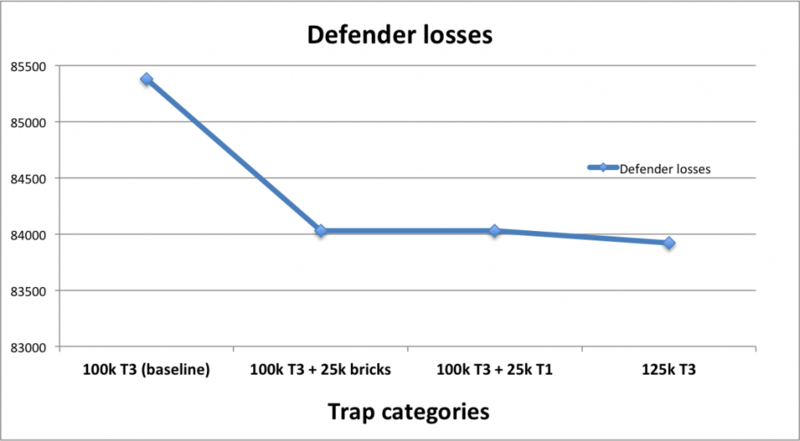 It is easy to appreciate that there is a steady increase in the power loss of the attacker as the wall tiers increase from bricks to T3, but the key highlight is the pattern of defensive power loss as the trap tier changes. As the tier gets higher, the power loss decreases, and this is basically in line with the reduction in T3 troops that are wounded, because the lower power traps are being destroyed. In each instance, all 30k bricks, T1 traps, and T2 traps were destroyed, and in the final test, only 1830 traps were destroyed. This gives the strong suggestion that the lower tier traps are acting as a meat shield for the higher tier troops. The interpretation of the T2 tests are somewhat more straightfoward. 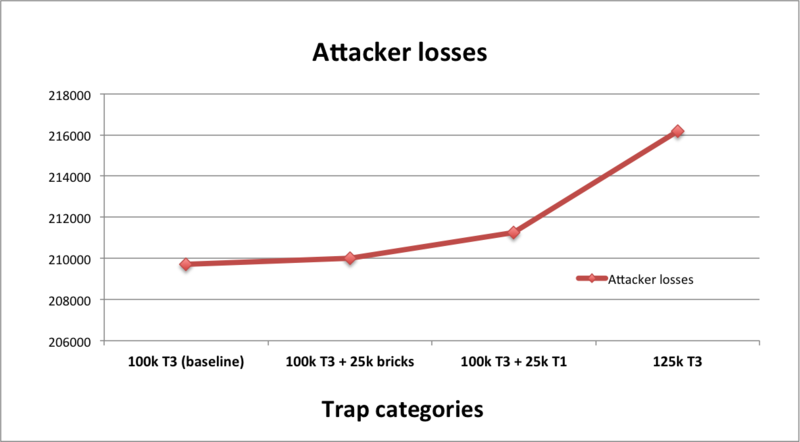 Again, attacker power loss increases steadily as the tier of defending traps gets higher, in that they kill more of the attackers troops. On the defensive side, the variance in defensive power loss is a lot lower than the T3 examples above. It is disappointing that we deleted the war bricks battle report, however I believe it is likely that it will have showed less defensive power loss than baseline, but not quite as much as with the T1 example. The way I interpret this is that if you want to minimise power loss when defending, then max out your wall with traps that are 1 tier lower than your lowest tier of troop. If your lowest tier of troops is T3, then fill your wall with T2 traps to minimise power loss. If your lowest tier of troops is T2, then fill your wall with T1 traps to minimise your power loss. The lower tier traps are acting as a meat shield for your troops, in that the lower tier traps have to be destroyed before your higher tier troops can be attacked. Of course, if you have 1M T3 troops and 125k T2 traps, then whilst having a trap meat shield for your troops sounds nice, the prospect of rebuilding a full wall of T2 traps after EACH ATTACK may seem daunting to some. Some people like to use Trap Salvaging, however some have stated that with the incomplete nature of trap salvaging (up to 70% at best), that it may make more sense to heal lower tier troops than to try and salvage traps, particularly if they are T1 troops in your hospital, as they instant heal. So far we have seen several instances where a T3 troop attack against a stronghold is not able to destroy a single T3 trap. Likewise, we have seen instances where all lower tier traps were destroyed, significantly reducing the number of higher tier troops wounded. So, lower tier troops appear to be acting as meat shield for higher tier traps, and lower tier traps appear to be acting as meat shield for higher tier troops. Maybe we should just consider traps to be another type of troop, but one we can only have a maximum of 125k of in our stronghold. To try and answer the question as definitively as possible in one test, what we are going to do, is to try and destroy our T3 wall with a stacked attack of Onagers and Siege Towers with siege attack hero gear, and see if we are able to bust them. It’s brick busting time!!! So, here we have 300k Onagers and a siege meat shield of 75k T3 siege towers. This is not quite the maximum solo march of siege you can send, but it is not far off. Here you can see that even though the T3-4 siege are weaker than regular troops, with a stacked hero they can still do a fair amount of damage to a T2 troop meat shield. However you will note that not a single T3 trap was harmed. The Onagers and Siege Towers would have had to wounded all 300k of the T2 troops to get a chance at destroying one of the T3 traps. Again, this appears to be confirmation that the T2 troops were acting as meat shield for the T3 traps, and not even a full march of stacked siege could do the trick of damaging a T3 trap. Lower tier troops act as meat shields for higher tier traps, and lower tier traps act as a meat shield for higher tier troops. That is all very nice and well, but what does it mean to a turtle? What I take out of this research is that your decision on which tier of traps to build is driven primarily by which tier of troops your army comprises. 2) should I just train some T2 troops and use them as a meat shield for both my T3 troops and T3 traps? The idea of having to have 50 hero skill points allocated to trap building during battle is one of which I am not particularly fond. I like to keep things simple, and quickly healing lower tier troops seems much quicker, simpler and cheaper than salvaging a proportion of traps, and rebuilding the remaining traps. The great thing about having wall traps ‘behind’ your troops meat shield, is that you will ALWAYS have a full wall. And as we saw with Myth 2, there appears to be something important about having a full wall. Even if it is only war bricks making up the last 1-25k traps, before you go into battle, make sure you have a full wall. It will help reduce your troop losses. The next 2 parts of this guide will look in more detail at combat boosts,i.e. 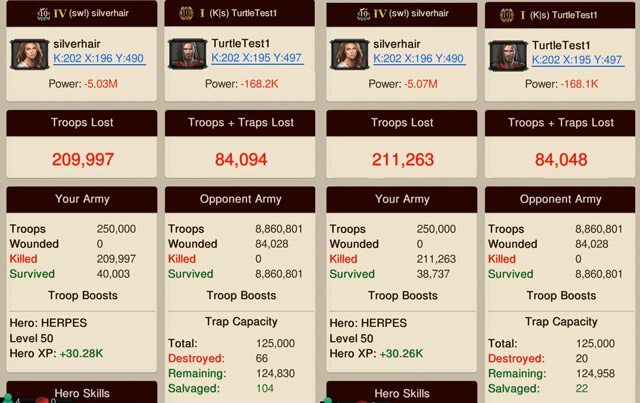 troop health, troop defence, troop attack etc, and what it means for selection of hero gear to equip your turtle. And then we are going to finish up with one final post summarising everything, and providing a view on the future of the turtle build as the game evolves. I’ve been wondering same things. Please address. How does trap attack effect the kill ratio? Do they kill more troops? If trap attack was higher than the enemies troop attack is there a kill difference and how much. Also does the defending stronghold need high troop attack if they are defending? Newbie, enjoying the articles, especially after running into a Turtle acct and getting hammered. At least now I know why I got hammered. But, I keep seeing references to NERF, no idea what it means. What are your thoughts on the strategy now that trap capacity can be increased? Is this a move by MZ to make siege more relevant? After all they wont want people to not train siege or build traps as these are the most expensive (and lucrative) troops.. It does seem daft to have siege troops if they are totally overwhelmed by vast troop numbers (just as daft as troops not dying when your food runs out) – maybe they’ll change the algorithm at some point to make siege hit traps only…? I have a rally turtle with 1.5m T2 meat shield and a large T3 army. The T2 troops are designed to take most of the hit and go to hospitals, but T3 are there to avoid the nerf, and to take the hit if the rally is larger than expected. 2. 220k T4 traps that won’t be hit at all, but lend more defense rating to the city. T2 traps would save more T2 troops, but would require rebuilding. Salvaging is not all that great, but it is better than nothing. T4 traps would kill more incoming troops. I personally would choose T4 traps, as I hate rebuilding traps, both in terms of speedup cost and res cost. If your city is optimised to speed train T2 troops, it will be much more cost effective than rebuilding traps. 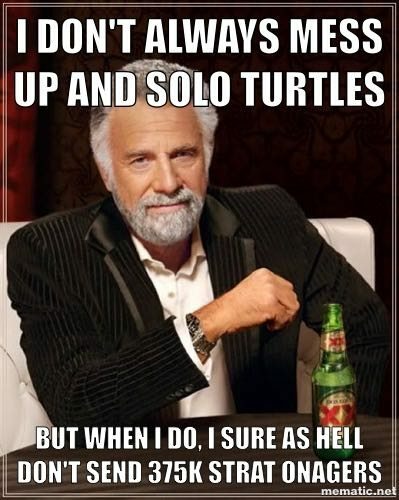 The reason this wasn’t answered, is because it does not relate to solo march turtles. Will cover these issues in a rally turtle series. Ok so I’m confused about the entire Turtle thing. I’ve been building my turtleness for a few months now and while on the onset it seems like it works I’m having a hard time with figuring out exactly how many Troops I need. My research is almost capped out for a SH 21/Aca 20 for combat, strat and traps. I’m getting close to the hero trap def and troop attack research but I’ve been hit a few times and just recently was completely and utterly clobbered by a group of outlanders. The only reason they were able to do this is because of a bug or something not showing that I was being hit – even while watching… with 666 T3, or a 2 million T1 I think that I MIGHT have fared better but without spending a huge amount of money to get the XENA gear I don’t think that I’ll find out… ever. Almost 90% of my traps were destroyed, no T3 troops were lost but my Hero was captured after the 6th march. I had had only 100k T1 350 k T3 and was trying to build up my forces but obviously wanted to see what damage I could do and possibly win some stuff to get to the vaulted Xena Gear (wax – I need wax dammit!). Anyway – my question is, How many T3 and how many other troops do I need? I’m not sure having an army of 2.6 million is going to work if someone has Legendary Gear, Core Gear and a crap ton of marches/time or rallies me – I’m dead in the water with only a fraction of my forces in beds healing (I have 400k) and then most of my traps gone or is it that with enough troops they’ll lose more troops and I’ll be ok? Once your hospitals are full you need to Shield before anymore Marches land on you. This Strat only work because u can heal hospitals, instantly if they are T1, and salvage traps. Once your hospitals are full then every hit after that just kills your troops. Heal while u can, then shield when the barrage is to much. A technical note… this post has not been properly categorized so it is hard to find it. Turtle category should be added. Another question about traps… If I make a T1 troop may shield & it acts not only as a meat shield for other troops, but also traps shouldn’t I research Trap Attack more heavily than Trap Defense? I think you’re right assuming you have a large enough meat shield that it will completely protect your higher tier traps. Rallies take time and you will see a notification coming on the bottom. Also, if you click on the alliance tab at the bottom you will see a bar that says “DEFEND! Send your Allies Reinforcements”. If you click on that you will see all of the rallies that are targeting your alliance. If you play with the sound on, I believe it plays a different music when you are being targeted for a rally. If the march/rally is already on its way then you will also see an icon on your screen. If you see a flag in the icon if it’s a rally but not if it’s a solo march. You can also click on that icon and it will tell you what is coming at you depending on the level of your watchtower. I believe that will be the next part of this guide. I asked the same thing in the boosts section. For me, I have 1.5 mil T1 and 600K T3 and was told to stay away from trap stuff and it makes sense. I have 700K troops of each kind (ranged, cavalry, and infantry) and only 125K traps. While the traps do damage, you benefit more from increasing the stats on your troops. I believe the enemy attack debuff and troop health are the ones you want to concentrate on the most. I absolutely love this series! SO well thought out and researched with data to back up assertions! I can’t wait for the next article! Thank you so much for your time writing up this series! So this is the math I came up with from your research. 1 t4 is equal to 4.5 t1s, 2.25 t2 or 1.5 t3. 1.5 t3 = 36 pts, 2.25 t2 = 18 pts or 4.5 t1= 9 pts. Killing a full 275k t4 solo March would score you 9.9 Mill pts. And now that hospitals don’t protect you from giving up points, this feels like a huge hit to turtles. Especially t3 based turtles. I need to go back and look at the combat logs from this guide to see how the points have changed. But it feels rough. Thanks for thinking this through so deeply, SugaShane. I like the approach, however the logic on the defending losses is not quite right. If set up correctly, the turtle should not lose 412k T3 or 618k T2 or 1.2M T1. That is at least twice the hospital bed capacity guidance from this guide, sand suggests the turtle needs more troops or better hero gear. I will the changes comprehensively in the final part of this guide. You are correct that the 8M T1 model is not NERFed. I have tested up to 12M T1. I see no great point in testing T1 any further. Feel free to do so yourself if you think you need more than 8-12M T1. Thanks for the new post. Always a good read. Now that they have changed KvK kill events to score based on power loss instead of troops killed/hospitalized, do you plan to update any of the previous posts? 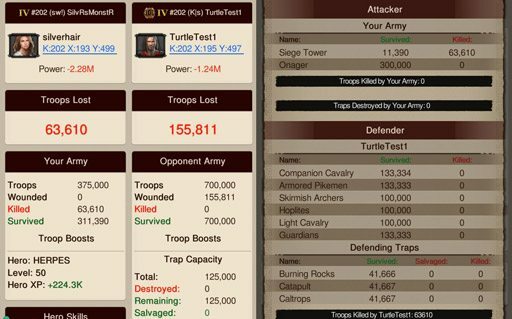 Particularly comparing troop combinations in crating your turtle army?